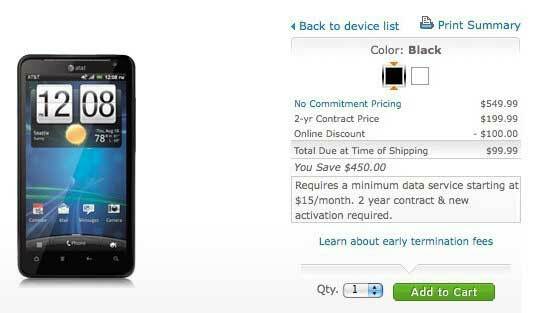 Last week AT&T announced the HTC Vivid and Samsung Galaxy S II Skyrocket for its newly developed high-speed LTE network. And now those LTE beasts are on sale on the carriers’ website with special online discounts. The Samsung Galaxy S II Skyrocket features 4.5-inch Super AMOLED Plus display and 1.5GHz dual-core CPU and a gig of RAM, will set you back $150 with a two-year contract. The HTC Vivid, with its 4.5-inch qHD display, 1.2GHz dual-core chip and 8MP 1080p recording rear camera will cost you just $99. You have two sign a 2-year deal for both of the devices. But I think this is not too much for these fastest mobile phones from AT&T. Both devices are running Android 2.3 Gingerbread but AT&T has revealed its update plans for the phones. While the confirmation is very vague, the Skyrocket and the Vivid will indeed get their Android 4.0 Ice Cream Sandwich treats sometime early next year. Of course, the exact roll-out timeframe depends a lot on how Samsung and HTC manage to get the refresh ready. After a carrier test (if everything goes well and the update doesn't have issues to be fixed) the platform refresh can be pushed out. AT&T’s Skyrocket and Vivid are meant to fight against Verizon’s recently announced LTE handsets, the Galaxy Nexus, the Droid RAZR and the HTC Rezound, although it looks like Verizon is winning this battle considering the increased hype around its upcoming LTE smartphones.